Skyscraper-high heels make a woman’s legs look longer and leaner. 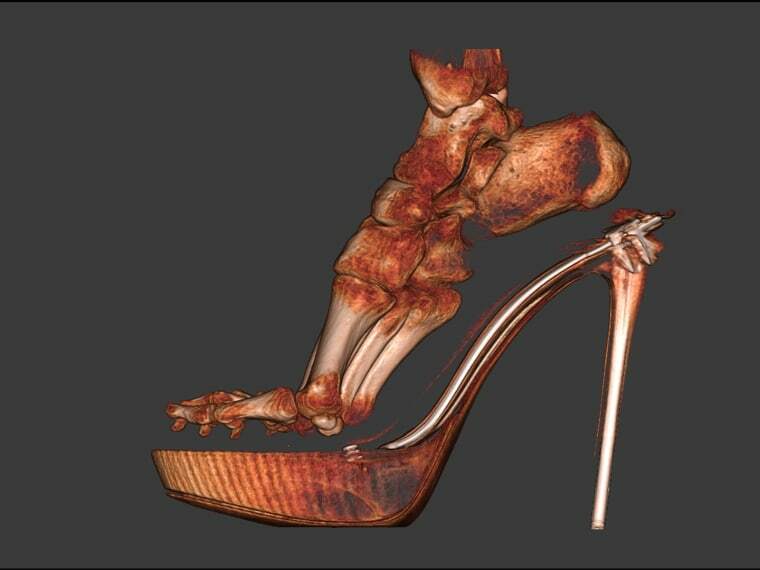 But if you look at the cramped, claw-toed, gnome-like three-dimensional images of a woman’s foot in some stilettos released by London’s Royal National Orthopaedic Hospital on YouTube, you might rethink your fashion choice -- at least for a while. The technology called pedCAT, manufactured by Warrington, Penn.-based CurveBeam, is a CT scanner designed specifically for foot and ankle issues. It received FDA approval in the U.S. last year and in Europe in 2013, says CurveBeam spokesperson, Vinti Singh, whose foot, in her favorite four-inch heels, was pictured in the scan. The biggest difference between this technology and traditional CT scanning of the foot and ankle is that it allows for the doctor to see the foot in “true, weight bearing positioning,” says Singh, who hasn’t developed any problems in her feet -- yet. And to keep it that way doctors agree that stiletto-moderation is the key to happy feet later in life. Indeed, the problems relate to high-heel mania are legion. Among the issues some women may develop are a shortening and tightening of the Achilles tendon, which may prohibit a woman’s ability to wear flat shoes. Tendonitis, pinched nerves, bunions, hammertoes or metatarsalgia, an inflammation of the bones in the ball of the feet, are also problems associated with the sky-high heel, explains podiatrist Jeffery Alexander, assistant professor at Rush University Medical Center in Chicago. Let’s not forget the truly unattractive “pump bump,” which happens when back of the shoe rubs against the heel bone, causing it to swell. And, of course, there’s always the potential for fractures or sprains among “. . . even the most seasoned” high heel wearer, he says. Currently, diagnosis of foot or ankle pain is made by taking a medical history, performing a physical exam and looking for abnormalities on plain, two-dimensional X-rays, says the Cleveland Clinic’s Donley, which is generally enough to get to the root of the problem. CT scanning, which has been available for many years, is used only when necessary due to its expense and the higher radiation dose. Even the dreadful looking CT scan of Ms. Singh’s own foot isn’t making her chuck her heels anytime soon. “I really only wear them on weekends,” says Singh, who is 26. “I think I’ll be fine when I’m older.” Spoken like someone who has yet to buy an orthotic, or a nice, sensible pump.